As I’ve said many a time and in many a way on this blog previously that it would be nice if my music could gain more recognition, awareness, reach a larger audience, etc. As long as I don’t have to be a famous celebrity where people would recognize me in public and bother me. That wouldn’t be much fun. It’s not that I’m after popularity for popularity’s sake, but rather, I think what I do is in some ways sort of a noble pursuit (writing and recording songs), and perhaps deserving of being more notable somehow. I’ve looked into what that means recently. People are actually buying my music here and there lately, which is exciting, and makes me think more of that would always be welcome, but then it makes me think of how and what I could be doing to make more sales happen without too much effort or investment on my part. My new album, which I released just over one month ago, has sold quite a few copies lately! Surprisingly, there are some out there who have purchased the physical CD directly from Amazon, and unsurprisingly, there have been a lot of single-song MP3 purchases from Google Play, Spotify, Bandcamp, and of course, iTunes. All great, and more would be even better. Makes me wonder what, out of the various free things I've done in my free time to make people aware my music exists, has been most effective in terms of conversions. I use some analytics and get some data from online music stores, but it's not much to go on. I sometimes wonder how to rise above the sales barely covering my costs, release after release, every two years. I don’t just consider the nominal distribution costs, but also the upgrading of recording equipment and instruments from time to time. Nowhere close to making enough money to cover the new Martin acoustic guitar….yet. You never know if some happy accident might catapult me into profitability….or better yet, from nobility to notability. When it comes to noble, I read it and say to myself “check” I’ve got those covered. When it comes to notable, however, I’m not sure I can honestly say it’s distinguished or prominent yet. The reason I wonder about notability is because if you want to get reviewed by or listed in certain well-known music-related online publications and databases such as AllMusic or Wikipedia, they require you prove you’ve already been written about in other publications or websites. Reference documents that indicate a level of prominence to gain more or higher prominence. You hear about people faking their number of social likes and friends and shares and tweets and adds and follows and that sort of thing. They do it because it works. The basic concept at play here is that perceived prominence and popularity whether deserved or real or otherwise, breeds actual increased, real popularity, thereby increasing real prominence. I won’t lower myself to those types of tactics, but I’m told they are effective. What it boils down to is spending my hard-earned free time bugging people to write about me and my music, so as to show documented importance and significance. Songs and singles are probably notable if they have been the subject of multiple, non-trivial published works whose sources are independent of the artist and label. This includes published works in all forms, such as newspaper articles, other books, television documentaries and reviews. This excludes media reprints of press releases, or other publications where the artist, its record label, agent, or other self-interested parties advertise or speak about the work. Coverage of a song in the context of an album review does not establish notability. If the only coverage of a song occurs in the context of reviews of the album on which it appears, that material should be contained in the album article and an independent article about the song should not be created. The following factors suggest that a song or single may be notable, though a standalone article should still satisfy the aforementioned criteria. Articles about traditional songs should avoid original research and synthesis of published material that advances a position. Note2: Sources should always be added for any lore, history or passed on secondary content. Wikiversity and WikiBooks have different policies and may be more appropriate venues. Wow, so after reading all that carefully, and summarizing it in my own notes I’ve now shared with you, the world, it is overwhelming. It’s one thing to find a list of online publications and blogs who write about independent music acts like me. That’s hassle enough. Then you need to email them a cover letter and link to free streaming samples of your music, or even mail packages of information and CDs to them. Now you’re talking about a lot more of your free time, plus some some potential cost for materials. After you find their submission policies on their websites, which is often difficult, they almost always say something to the effect of 1) we get tons of these every day, and can never review them all, or maybe we have someone briefly read/listen to your submission, but we can not possibly write about them all, and 2) we don’t ever return your stuff. So, no guarantees, and you start to wonder, “who has time for this stuff?...especially for most of us with day jobs and personal lives?” The answer is probably along the lines of don’t give up trying, hard work eventually pays off, lots of irons in the fire increases your chances, etc. It would be cool if you had money to pay someone else to do all this for you, wouldn’t it? I guess when you get signed to a record contract with a major label you get an advance to pay people to do this stuff for you. The Behind The Music or Where Are They Now types of shows on TV always seem to cover famous artists who sold millions and not only never became wealthy, but in fact ended up in more debt than before they were signed to the record deals. On the other hand, there are artists who become so famous from major-label marketing budgets, when they get out of their contracts, they can still sell a ton of records on their own. This has happened more and more frequently in recent years I would imagine due to the ways in which the internet has changed the music business. I’ll stick to what I like - writing and recording songs in my basement, and selling enough online to cover most of my costs - except the Martin guitar. I will keep hoping for a lightning strike of dumb luck or some phenomenon described with the word “viral” to accidentally occur. This is like hoping you’ll win the lottery. Not very good odds, but fun to think about it once in a while. It would be nice to be more notable. Here it is 10 pm and I'm home already after watching the Violent Femmes play live at the Common Ground Festival in Lansing tonight. They did not disappoint. They were excellent, in fact. Exceeded my expectations. They played slightly over an hour from 8-9pm as scheduled. I went with my lovely wife Lenore. If you can look beyond my giant head in the photo above, you can see Brian Ritchie on the right with his acoustic bass and Gordon Gano with his violin on stage. I like this band so much, I even went so far as to pay for a t-shirt - a black one that says "American Music since 1981" on it - something I rarely do. After all was said and done, I spent around $100 bucks for a few hours of great live music in a beautiful park setting by a river. It was 35 bucks times 2 tickets, plus $6 parking, plus drinks and snacks that included both a funnel cake and an elephant ear. Mmm. Got to see a couple other bands as well, including The Wailers, who have a singer who sounded just like Bob Marley, and guys in their band who are close relatives of the original Wailers. They played the hits from the Legend album everyone expected, so of course it was great. Also saw some band who I think said were from Mississippi and called The Weaks, which was funny because they were all ultra skinny guys. They played a good blend of originals that ranged from danceable funk to hard rock with alternative stuff in between and even a tinge of southern rock. All wonderful and worth it. I ran into a coworker who was there with his son, which was cool. He thought it was worth the cost as well. We talked about how it's an unique genre, a niche band that created a style of their own and has influenced many since. He and I had previously chatted in the break room at work while getting coffee about our love of this band, and how he was turned on to them by his son, who is in a band, who were influenced by them, just as I have been. He wishes his son's band would be "discovered" and subsequently signed to a record deal by being asked to open for the Pretenders while playing acoustic on the street, of course, just like what happened to this band. Who wouldn't wish that for any band? The wife and I don't get out much - mostly because I'm an introvert who is either sitting at my computer, writing or recording a song, or watching television. She is an extrovert, however, and craves being out in public, loves crowds, and feeling a part of the community. So, of course I spun this outing as catering to her cravings, even though it has been something I've wanted to do since 1983 when their first album came out. She agreed to go, despite her tastes including Wayne Newton, Barry Manilow, The Bee Gees, and Journey, and her only knowing and subsequently recognizing one Violent Femmes song, Blister In The Sun. She and I observed a crowd of people around our ages, many of whom knew every word to every song like me and were obviously in a total state of joy while watching them play. There's nostalgia in going to see a band like this because they remind you of good times you had in 1983/1984 when that first album was popular. If you happened to be around age 16 at that time like me, the album probably meant a lot more than to someone who discovered it at a different age, I've surmised. The crowd was an eclectic mix as you might expect and the people watching was a bonus. I didn't feel old, like I sometimes do nowadays at concerts. What was a very smart approach on their part was that they played that first album in its entirety to open the show, then ventured into a few lesser-known songs from other albums that had a more Americana feel as opposed to the acoustic punk rock sound of that first album. Not sure if it was the original drummer or not, but this guy was outstanding, playing stand-up style with two primary drums played with brushes - one bass-sounding drum looked like a pony keg of beer, and the other a snare with a couple small cymbals. The bass player of course played that huge Ernie Ball acoustic, but later switched to an electric bass. The acoustic bass solos were outstanding, as expected. They augmented their three-piece band with a cajon player throughout, and also had a horn section for a few songs, and the marimba for Gone Daddy Gone, which again, was outstanding. Acoustic bass solos, an impressive drum solo on a minimalist kit, great backing vocals, too. Although Gordon isn't much of a soloist on guitar or fiddle, and only played his telecaster as opposed to an acoustic, his unique, whiny vocals were as good if not better than what you hear on the records. So, all the ingredients that make up their signature sound were there, combined with some extended jamming, and an expanded lineup. All awesome. Overall, a great experience to see one of the most unique bands of all time thirty years after their debut, still sounding as great as ever. I'd heard their Viva Wisconsin live album, so I had an idea of what they sounded like live, but to see them in the company of other fans like myself was one of the best live music outings I've ever had. I won't forget it, and feel inspired again to write more songs after quite a long drought. 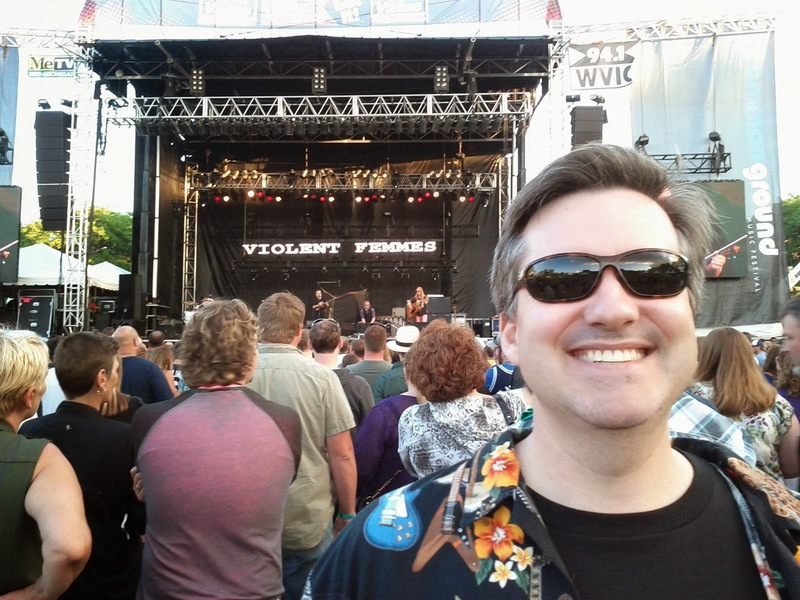 Thanks, Violent Femmes!